Geography of the Edge (The Borimix: Puerto Rico Fest 2018 visual arts group exhibition) which opened November 2 at The Clemente Soto Velez Cultural Center, includes 32 artists from Puerto Rico, Colombia and others with more abstract/poetic connections to either country living in NY and abroad. It explores definitions of nationality more closely tied to philosophy and aesthetics than geography. Guest Borimix curators Maria Elvira Dieppa and Manuela Gonzalez along with Festival co-Founder and Associate Producer Miguel Trelles are keen to open/visit the liminal space/geography of those national identities, particularly outside of their countries of origin. In the case of Colombia and Puerto Rico the curators understand that Colombia, while being Latin America in the continental sense, also directly connects and harbors a rich Caribbean identity, thus boasting a strong tie with the Antilles and a particular rich cultural exchange with Puerto Rico and New York since the explosion of salsa music in the 1970’s. The conceptual anchorage for this particular coupling derives from famous Chilean literary luminary Roberto Bolaño. In his acceptance speech for the 1999 Romulo Gallegos Prize, Bolanos described how his possible undiagnosed dyslexia led him to mix up the capital cities of Bogota, Colombia and Caracas, Venezuela. Those of us that have a Catholic saint for a capital (San Juan, Puerto Rico, San Jose de Costa Rica, Santo Domingo, Republica Dominicana) occasionally experience similar mix-ups. With our exhibition we celebrate this Pan American dyslexia. We abandon the parameters of passports and frontiers for a more poetic, intuitive, fluid method of categorization.What would be to quote Bolaños, the “imaginary solution” to this “imaginary problem”? Installation by Daniela Gomez-Paz, 2018, Photo by Camila Falquez. César Alvarez, Namen Basil, Johanna Bock, Nestor Cristancho, Juan Eduardo Gómez, Daniela Gómez, Jorge González, Martin González, Mauricio Higuera, Michiko Kurisu, Martin Medina, Felipe Molina, Horacio Molina, Yasira Nun, Iliana Ortega Simon (e) Jairkiriuma Pateau y Aera Negrot, Michelle Repiso, Eduardo Restrepo-Castaño, Christopher Rivera, Julia Rivera, ROCARD, Jason Rosenberg, Edward Salas, Phyllis Sanfiorenzo, Lydia Rubio, Ramón Vega, Luis Carle, Silvio de la Cruz, Guadalupe Maravilla, Jean Paul Gómez, LA2Angel Ortiz, and Camilo Villegas. Manuela Gonzalez is a Colombian-born, Brooklyn-based artist, curator, and educator. She is a graduate alumni of Yale University School of Art, where she received her MFA with a focus in painting. She is also a Rhode Island School of design alum. Gonzalez has participated in several museums’ outreach and education programs including the Abrons Art Center and El Museo del Barrio. Gonzalez’ own studio practice focuses on performance and mixed media sculpture. Maria Elvira Dieppa is a painter and curator living between New York City, London, Berlin, Boston, Barranquilla and Bogotá, Colombia with her latest project Nomad Studio. She graduated from Parsons School of Design in the late 80’s. 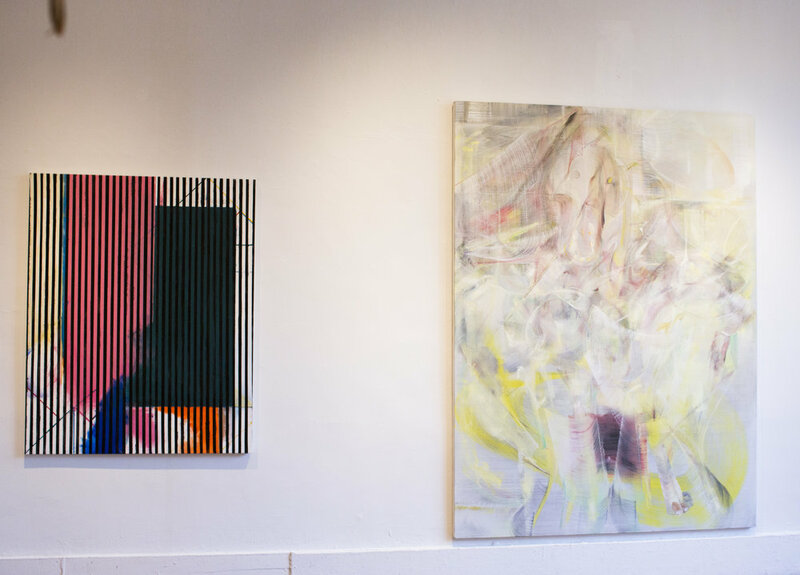 Dieppa has been curating shows since 2009, her latest; Luces desde la Isla, Island and Geography of the Edge took place in New York and Longon last year. In her studio practice as a painter she is interested in color, form, intuition and the development of a thought process thru paint as language. Her work has been exhibited in various group shows. Miguel Trelles is a resident artist at the Clemente Soto Velez Cultural Center, where he is associate producer / curator of Borimix Puerto Rico Fest. His essays about the Puerto Rican silkscreen movement and the collection at Hunter College have appeared in catalogs from the Center for Puerto Rican Studies at Hunter and the Hunter College Art Galleries: Posters on the Wall, Our Nuyorican Story (Centro, 2012) and Aesthetic Accomplishments, Political Commitments (Hunter, 2007).